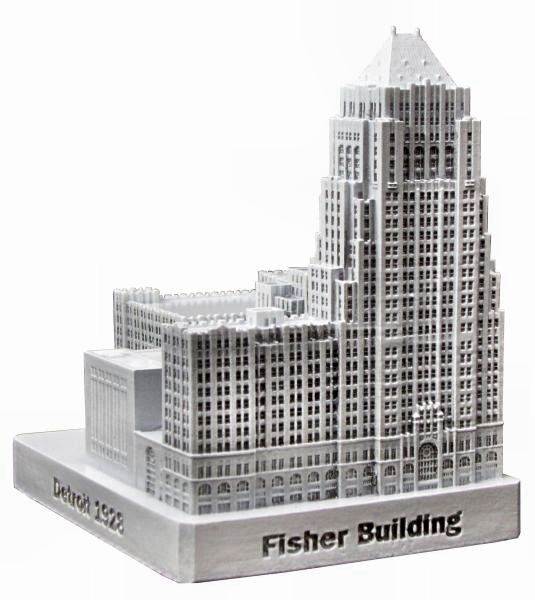 The Fisher Building is located at 3011 West Grand Boulevard in Detroit, Michigan and was completed in 1928. This building was designed by Joseph Nathaniel French of Albert Kahn Associates and stands 444 feet tall with 30 floors. This pewter replica stands 3-3/8 inches tall and is finished in white with black stain. This model's scale is 1 inch = 150 feet. Great addition to my Detroit. Looks best with white with green highlights. Very fun piece.